Explosive breaker Nobelium defeated a red hot field tonight when she led throughout to win the Giddyup Quaddie Time Mixed 4/5 over 405m. 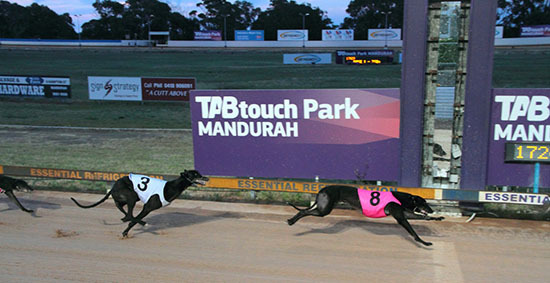 The daughter of Dyna Double One burst to the front before clocking a flying 6.59 to the first marker. She powered away to score by three lengths over the fast finishing Westdale Ares who charged home after a moderate getaway. Maude Monelli finished third for David Hobby ahead of Abba Monelli who is trained by Pete Brown. Nobelium has now started 13 times for 6 wins and 5 minor placings. Her winning time of 22.65 was a new PB which will see her competitive at the top level over the 405m distance. Race 3 Number 3 LEILANI’S LAD : Soldiered on strongly for second at huge odds. Race 4 Number 3 WESTDALE DRIFTER : Put in another faultless display leading throughout in a slick 22.56.